Santiago, Chile, Monday 21 January 2012. Race2Recovery, the group of predominantly injured soldiers who formed a rally team to raise funds for Forces charities, were today celebrating the sensational achievement of becoming the first ever disability team to complete the world’s toughest race – the Dakar Rally. The team’s Land Rover Defender-based Wildcat race vehicle of driver Major Matt O’Hare and co-driver Corporal Phillip Gillespie, crossed the finish line in Santiago, Chile, yesterday to signal the end of an extraordinary two weeks of racing. The team received Royal backing when, in November, it became the first ever recipient of a grant from the Endeavour Fund, set up by the Royal Foundation of the Duke and Duchess of Cambridge and Prince Harry. “Catherine and I have heard the wonderful news about your success today ? many, many congratulations. “We know it was not easy, but you have today become true record holders as the first ever disability team to complete what is one of the world's toughest challenges. The Race2Recovery team’s four Defender-based Wildcat race vehicles took to the start line in Lima, Peru on the morning of Saturday 5th January, signalling the start of 15 days of racing 8570km over extreme mountain and desert terrains. 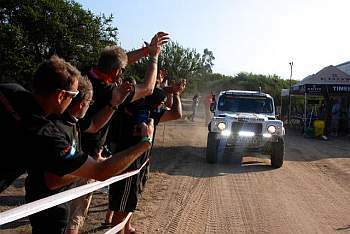 However, the team’s Wildcat vehicle ‘Joy’, donated to the team by the Peter Harrison Foundation and named after Peter’s wife, Joy, who sadly passed away in September last year, remained firmly in the race. Suffering from some over-heating problems during the first half of the rally, the team were regularly forced to do more of their driving at night. However, the team’s mechanics were able to do major work to the vehicle on the event rest day, fixing a number of issues and enabling Major O’Hare and Corporal Gillespie to make great progress through the second week. The scale of their achievement is highlighted by the statistics of this year’s rally, which saw over a third of race vehicles retire from the Dakar Rally, with the Race2Recovery team outlasting a huge number of vastly more experienced competitors. The team operates to the motto ‘Beyond Injury – Achieving The Extraordinary’, and set up its Dakar Rally challenge in order to inspire people who may be injured, ill or facing adversity. Through its racing activity, Race2Recovery has been raising money for Tedworth House Personnel Recovery Centre, one of six Personnel Recovery Centres that have been established as part of the Defence Recovery Capability. The Defence Recovery Capability is an MOD-led initiative in partnership with Help for Heroes and The Royal British Legion to ensure wounded, injured and sick servicemen and women have access to the key resources they need as they recover. The Race2Recovery team aims to continue its charitable fundraising way past the end of this year’s Dakar Rally. The official book, ‘Race2Recovery: Beyond Injury, Achieving the Extraordinary’, will be published by Haynes and FireStep Publishing in March 2013. £2 from every copy will be donated to Help For Heroes (www.haynes.co.uk/race2recovery). Donations to the Race2Recovery fundraising campaign can be made at www.race2recovery.com or to donate £5 via mobile text RACE20 £5 to 70070. The team are also encouraging people to follow them on Google+ (Race2Recovery), Twitter (@race2recovery) and Facebook.